This interview took place in September 22, 2011. Jesus freak Hideout (Scott Fryberger): Before you put out this new EP, Mold Me, was the last thing you did The Average Joe in 2003? Joey's Dream (Joey): No. I mean, as a solo artist, yeah, but with L.A. Symphony, we put out - well, I don't remember which came out first, The End Is Now or Average Joe, but I know we put out Disappear Here with Gotee after Average Joe. We also put out something with Syntax, which was...I don't even remember what that record was called. We had maybe two new songs on it, and the rest of them were like old, random things we hadn't released for whatever reason. But as a solo artist, yeah, definitely. This is the first since Average Joe. JFH (Scott): Mold Me is obviously a departure in style. What made you want to do something other than hip hop? Joey: I think there's a lot of reasons. The natural progressioning of me making music. Saying, "Okay, can I sing? Can I pull this off? Can this work out for me?" And I was like, "I think I can pull that off." As well as: I think you look at different bands, like Pillar, who started off doing rap/rock, and then they went from rap/rock to similar to Kutless. Mat Kearney coming out kinda pushed me - not pushed me, but made it seem like something that could make sense, you know what I mean? More success in that market seemed realistic, I guess. I was at a place of "I have nothing for the Christian market. They're not gonna take anything I could give them." I can sing a little, but I don't have this outstanding, amazing voice. And maybe that's just self-consciousness and insecurity or whatever, but yeah I think those couple of things were it. And then I wrote a song with the worship leader at a church I was going to in 2003, and people thought it was kinda cool. I ended up writing a couple of songs with him, and I sent one of those songs off to Matt Dally [Superchick], and he was like "Yeah I really like this!" And it really boosted my confidence to say that I could really do this; this might be able to work out. JFH (Scott): And how do you know Matt Dally? Joey: From shows. I think I first met Matt at a youth specialty show. But yeah, we've played so many shows with Superchick as L.A. Symphony. So many shows it's not even funny. JFH (Scott): Did he do any instrumentation on the album? Joey: Yeah he plays on just about all of the songs. Like "Instrumental" - that was made in his house, in his bedroom. When he first moved to Nashville, he was living in this house and renting out a room there, and we did it in his room. He had all his stuff set up, and we started that song from scratch. "Poetry In Motion" is another song we started from scratch in his bedroom. He plays all the instruments on "Mold Me." It started off kinda as a skeleton, and then he re-wrote it from there. Same with "Why?" and "Poetry In Motion." That one was his, and he played everything except drums on that one. And he played some programmed drums on random songs as well. JFH (Scott): So even with Dally playing on the album, would you still consider Joey's Dream a solo project? JFH (Scott): Yeah, I think I get it. JFH (Scott): Now, what does the name Joey's Dream mean? Where did that come from? Joey: My rap name was Joey the Jerk, and "Joey the Jerk" just doesn't work for soccer moms and stuff. *laughter* I just needed to call it something different, and I had been thinking for years "Oh, maybe I can call myself Joey the Gentile" (cause I'm not Jewish). But I don't know, I thought it sounded cool and sounded like a band, kinda like there's Owl City, but it's really just a guy. So yeah, it sounded like a band I thought it could work, so whatever. And there's a tie-in to me, cause it's Joey's Dream. And I looked for Scriptures on it, and I came across Joseph, the guy who could interpret dreams. And his life is like riddled with dreams, and he has the dreams early on, and his brothers are bowing to him, and he's like "Yo, what's that about?" And then he goes to Pharaoh, and he's captured, and he gets sold into slavery and he starts interpreting dreams. And I was trying to find a way that I could spin that, but nothing really worked out in any real way. But it sounded cool. JFH (Scott): Sometimes that's all you need. JFH (Scott): One of the songs I really like is "Sierra," which feels very personal, and like it might be kinda painful to sing it. What's the story behind that song? Joey: Well, for one, it's not about me, so it's not really that painful to sing. Not for me at least. But my wife's sister, when she was a teenager, got pregnant and had a baby. And she had to put her up for adoption. That was years before I met my wife or her family. And so I met and married my wife, and - I don't think I knew this before - early in our marriage, possibly the same year we got married, my wife's sisters (who are all married and all have kids) and all my in-laws went and spent the weekend at Sierra's house. And she lived in like the Riverside [California] area, about an hour north of us. And we all went up there and we spent the night, and part of me was thinking that it was weird. I mean, we were her family, and we're all hanging out at her adopted family's house like we're all a big happy family. And it was very casual, and no one was really emotional like normal. And my sister-in-law, who gave birth to Sierra, she had two other kids at the time, and one of them was about seven, and the other one was probably about four. And as we were leaving, everyone was crying, and it was so emotionally-draining, and it was hard to leave. And that's when it became sad, because Sierra looks just like my sister-in-law. And it's crazy, cause we're just leaving her at this house, like "Okay, bye!" And I had never done that before, so I was a little weirded out. And so on the way back, my niece, the seven-year-old, said something like "Why are we leaving Sierra there?" She didn't get it, cause she was little. And I remember coming home and thinking how crazy it was, cause it was so emotional for all of us. And I wondered how emotional it must be for my sister-in-law, cause that's her kid. So, we left on a Sunday, and Monday morning I woke up at like six or seven in the morning - really early for me at the time - and this song was in my head. So I wrote the first verse and the chorus, and I wrote it from the perspective of my sister-in-law. And the thoughts wouldn't leave my head; like how she must feel. How did that feel? And my wife's family is all Christian, so part of me was thinking that she must have such peace about it, cause God is bigger than it all, but I mean...I don't know. It was just weird. I couldn't put it into words. It was just a weird moment in my mind, and I couldn't shake it. So yeah, I woke up with the song, and that's just kinda where it went. JFH (Scott): One of the other songs I like as well is "Mold Me." It's a very humble song. It's there a specific event that that was birthed out of? Joey: No, not at all. *laughter* When I decided to pursue this project, I hit up Grant Harrison and he sent me a ton of beats that were all musical. So they weren't just all hip hop style drum samples. And I got to one, and I started writing, and really I just wrote ["Mold Me"] from that beat. That was the original catalyst of the song. And then I took it to Matt, and he replayed everything and changed some things and added a bridge. So Matt took what I already had and added to what skeleton I had from the beats I was given. And that song is more of where I want my heart to be and where I want my mind to be, and it's just a great reminder of what kind of attitude I wanna have. I will say this: late in the L.A. Symphony touring, as it was winding down in like 2005 or 2006-ish, and we were broke and stuff, I was saying to myself "If we're not gonna make any money, at least use me God." And I remember praying that on just about every trip. "Just use me, God. Make this count for something if this is where You have me right now." And maybe that's the beginning of that song. Or at least the attitude that led to that song. JFH (Scott): Now who was the guy that sent you those beats? Joey: Grant Harrison? He produced some stuff for John Reuben a few years ago. Joey: He's out of Ohio. Er, actually he's out of Nashville. JFH (Scott): With Joey's Dream having a pop rock feel to it, what prompted you to release it through illect, which does all hip hop? Joey: Well, when I first made it, I shopped it around, and I met with Fervent. Susan Riley was the lady I met with, and she really liked the songs. She kept saying "I love these songs, I love these songs." And I thought "Oh wow, okay, this is gonna work out. She loves these songs." When I recorded these songs, I was in school - after I stopped touring with L.A. Symphony, I went back to college to get a degree, cause that's what you're supposed to do in America. Get a degree and a job and blah blah blah, right? So that's what I did, and in the middle of that, I recorded these songs. And I met with Fervent, and she loved the songs, but I didn't have a Facebook or a MySpace or anything. I wasn't doing anything with them except making songs. So then Fervent's like "Well, you don't have anything except some songs." So they weren't that interested, and that didn't end up going down. I also shopped to random people, and tobyMac really liked "Wake Me Up." So he was listening to that for a while, trying to think of how he could make that song his own. I wasn't gonna put it on my album. I was just gonna leave it off and let him do what he was gonna do with it. So he played with the song, tried to make it his own, but he just couldn't figure it out, or for whatever reason he didn't use it for his album, so I took it back. And I was gonna put the album out myself, and a friend of mine was gonna fund it, but then he bought a house. So while I was doing it myself, I called Jon Madison at illect and asked if he would take some photos for me. He asked what I was taking photos for, and I told him I had this project I was working on, and he asked why I didn't bring it by them. I said "Cause you guys do rap music, and this isn't rap. It wouldn't make much sense." And he said they were thinking about doing some other stuff, and that I should bring it by Josh [Niemyjski] and see what he says. And Josh thought it sounded good. He said "But I can't put it out tomorrow. I've got an order of people with projects." I said "Alright, whatever. It's cool." And that's kinda how that got going. JFH (Scott): Well, you've got a good group of people on that roster. Joey: Yeah, definitely. Josh has been doing rap music for years. JFH (Scott): Yeah, man. And do you have plans to do another Joey the Jerk album? Joey: I don't know. I'm always making songs in my mind. I'm doing a project with Flynn as well, but it's not as rappy. It's kinda rappy/singy as well. But Joey the Jerk alone? I don't know if I'll ever do just a rap album by myself again. Cause I don't think the kinda rap music I make by myself, or that I would make by myself, is...how do I say it?...I wouldn't know where to put it. I don't think the Christian market is in love with rap music. I don't think there's a place - well, there's a place there for it, but it's such a small place. Not like it's ultra-competitive, but there's no radio...RadioU plays rap music, but outside of that, there's not a lot of media for Christian rap music. Even at festivals, they'll bring on maybe two or three guys. I mean, out of all the dudes putting out Christian rap records, you twenty-five or however many it is are competing for these three slots. And it's like, even then, there's such a glass ceiling...you're better off pursuing vertical music, Christian hit music. But that lifestyle - I have a wife and kids, and I don't wanna take them to that 1AM show. Like "We're going on at 2!" You know what I mean? That's what the underground rap scene is like. So, to do a Joey the Jerk rap album, I don't know. I don't see that happening. JFH (Scott): Okay, well, that's everything I had for you. Is there anything you'd like to add in conclusion? Joey: Ummmmm.......I don't know. *laughter* Sure...no...yeah. It was fun making the record, and I hope to make more! 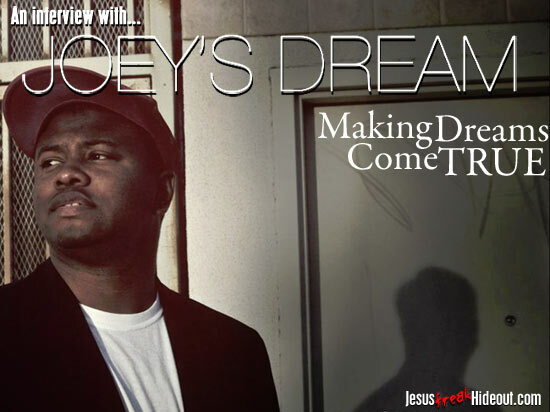 Joey's Dream is available now through illect Recordings!